For other uses, see Inhaler (disambiguation). An inhaler (puffer or pump) is a medical device used for delivering medication into the body via the lungs. It is mainly used in the treatment of asthma and chronic obstructive pulmonary disease. Zanamivir, used to treat influenza, must be administered via inhaler. To reduce deposition in the mouth and throat, and to reduce the need for precise synchronization of the start of inhalation with actuation of the device, MDIs are sometimes used with a complementary spacer or holding chamber device. The most common type of inhaler is the pressurized metered-dose inhaler (MDI) which is made up of 3 standard components- a metal canister, plastic actuator, and a metering valve. H&T Presspart, based in Blackburn, UK, provide over 75% of the world's can and actuator components to the pharmaceutical market. The metering valve is supplied by a number of companies including Aptar and Coster. In MDIs, medication is typically stored in solution in a pressurized canister that contains a propellant, although it may also be a suspension. The MDI canister is attached to a plastic, hand-operated actuator. On activation, the metered-dose inhaler releases a fixed dose of medication in aerosol form. The correct procedure for using an MDI is to first fully exhale, place the mouth-piece of the device into the mouth, and having just started to inhale at a moderate rate, depress the canister to release the medicine. The aerosolized medication is drawn into the lungs by continuing to inhale deeply before holding the breath for 10 seconds to allow the aerosol to settle onto the walls of the bronchittus and other airways of the lung. 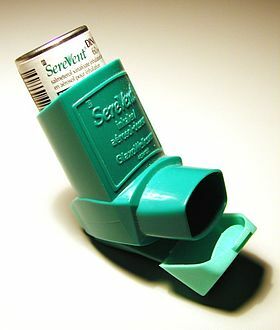 Some inhalers are made to act instantly in case of an asthma attack, and others are made to act later. Dry powder inhalers (DPI) release a metered or device-measured dose of powdered medication that is inhaled through a DPI device. Nebulizers — supply the medication as an aerosol created from an aqueous formulation. Nasal inhalers contain decongestant drugs to relieve nasal congestion in the upper respiratory tract. The active ingredient in most decongestants is either pseudoephedrine or phenylephrine. Many are sold over-the-counter without a prescription. In 2009, the FDA banned the use of inhalers that use chlorofluorocarbons (CFC) as propellants. In their place, inhalers now use hydrofluoroalkane (HFA). HFA is not environmentally inert as it is a greenhouse gas but it does not affect the ozone layer. While some asthma sufferers and advocacy groups contend that HFA inhalers are not as effective, published clinical studies indicate CFC and HFA inhalers are equally effective in controlling asthma. While the impact of CFCs from inhalers on the ozone layer had been minuscule (dwarfed by industrial processes using CFCs,) the FDA in its interpretation of the Montreal Protocol mandated the switch in propellants. Patients expressed concern about the high price of the HFA inhalers as there are no generic versions, whereas generic CFC inhalers had been available. The idea of directly delivering medication into the lungs was based on ancient traditional cures that involved the use of aromatic and medicinal vapours. These did not involve any special devices beyond the apparatus used for burning or heating to produce fumes. 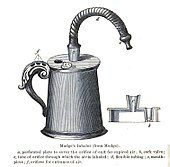 Early inhalation devices included one devised by John Mudge in 1778. It had a pewter mug with a hole allowing attachment of a flexible tube. Mudge used it for the treatment of coughs using opium. These devices evolved with modifications by Wolfe, Mackenzie (1872) and better mouth attachments such as by Beigel in 1866. Many of these early inhalers needed heat to vapourize the active chemical ingredient. The benefits of forced expiration and inspiration to treat asthma were noted by J. S. Monell in 1865. Chemicals used in inhalers included ammonia, chlorine, iodine, tar, balsams, turpentine camphor and numerous others in combinations. Julius Mount Bleyer used a variation in 1890 in New York. In 1968, Robert Wexler of Abbott Laboratories developed the Analgizer, a disposable inhaler that allowed the self-administration of methoxyflurane vapor in air for analgesia. The Analgizer consisted of a polyethylene cylinder 5 inches long and 1 inch in diameter with a 1 inch long mouthpiece. The device contained a rolled wick of polypropylene felt which held 15 milliliters of methoxyflurane. Because of the simplicity of the Analgizer and the pharmacological characteristics of methoxyflurane, it was easy for patients to self-administer the drug and rapidly achieve a level of conscious analgesia which could be maintained and adjusted as necessary over a period of time lasting from a few minutes to several hours. The 15 milliliter supply of methoxyflurane would typically last for two to three hours, during which time the user would often be partly amnesic to the sense of pain; the device could be refilled if necessary. The Analgizer was found to be safe, effective, and simple to administer in obstetric patients during childbirth, as well as for patients with bone fractures and joint dislocations, and for dressing changes on burn patients. When used for labor analgesia, the Analgizer allows labor to progress normally and with no apparent adverse effect on Apgar scores. All vital signs remain normal in obstetric patients, newborns, and injured patients. The Analgizer was widely utilized for analgesia and sedation until the early 1970s, in a manner that foreshadowed the patient-controlled analgesia infusion pumps of today. The Analgizer inhaler was withdrawn in 1974, but use of methoxyflurane as a sedative and analgesic continues in Australia and New Zealand in the form of the Penthrox inhaler. ^ Hickey, A.J., ed. (2004). Pharmaceutical Inhalation Aerosol Technology (2nd ed.). NY: Marcel Dekker. ^ a b Nick Baumann (July–August 2011). "Why You're Paying More to Breathe". Mother Jones. ^ a b "Asthma Group Concerned "Green" Inhalers May Not be as Effective | ksdk.com | St. Louis, MO". ksdk.com. Retrieved 2010-11-21. ^ Hendeles L, Colice GL, Meyer RJ (March 2007). "Withdrawal of albuterol inhalers containing chlorofluorocarbon propellants". N. Engl. J. Med. 356 (13): 1344–51. doi:10.1056/NEJMra050380. PMID 17392304. ^ Cohen, J. Solis (1876). Inhalation in the treatment of disease: its therapeutics and practice. Philadelphia: Lindsay & Blakiston. ^ Bleyer, J. Mount (1890). "A new method of larygeal and bronchial medication by means of a spray and tube during the act of deep inspiration. Read in the Section of Laryngology and Otology at the Forty-first Annual Meeting of the American Medical Association, Nashville, Tenn., May, 1890". Journal of the American Medical Association. 15 (18): 634–636. doi:10.1001/jama.1890.02410440006001a. ^ Wexler RE (1968). "Analgizer: Inhaler for supervised self-administration of inhalation anesthesia". Abbott Park, Illinois: Abbott Laboratories. Retrieved 2010-11-21. ^ a b c d Romagnoli A, Busque L, Power DJ (1970). "The "analgizer" in a general hospital: a preliminary report". Canadian Journal of Anesthesia. 17 (3): 275–8. doi:10.1007/BF03004607. PMID 5512851. ^ Packer KJ, Titel JH (1969). "Methoxyflurane analgesia for burns dressings: experience with the Analgizer (subscription required)". British Journal of Anaesthesia. 41 (12): 1080–5. CiteSeerX 10.1.1.1028.6601. doi:10.1093/bja/41.12.1080. PMID 4903969. ^ Major V, Rosen M, Mushin WW (1966). "Methoxyflurane as an obstetric analgesic: a comparison with trichloroethylene". BMJ. 2 (5529): 1554–61. doi:10.1136/bmj.2.5529.1554. PMC 1944957. PMID 5926260. ^ Dragon A, Goldstein I (1967). "Methoxyflurane: preliminary report on analgesic and mood modifying properties in dentistry (subscription required)". Journal of the American Dental Association. 75 (5): 1176–81. doi:10.14219/jada.archive.1967.0358. PMID 5233333. ^ Firn S (1972). "Methoxyflurane analgesia for burns dressings and other painful ward procedures in children (subscription required)". British Journal of Anaesthesia. 44 (5): 517–22. doi:10.1093/bja/44.5.517. PMID 5044082. ^ Josephson CA, Schwartz W (1974). "The Cardiff Inhaler and Penthrane. A method of sedation analgesia in routine dentistry". Journal of the Dental Association of South Africa. 29 (2): 77–80. PMID 4534883. ^ Babl F, Barnett P, Palmer G, Oakley E, Davidson A (2007). "A pilot study of inhaled methoxyflurane for procedural analgesia in children (subscription required)". Pediatric Anesthesia. 17 (2): 148–53. doi:10.1111/j.1460-9592.2006.02037.x. PMID 17238886. ^ Grindlay J, Babl FE (2009). "Efficacy and safety of methoxyflurane analgesia in the emergency department and prehospital setting". Emergency Medicine Australasia. 21 (1): 4–11. doi:10.1111/j.1742-6723.2009.01153.x. PMID 19254307. ^ Babl FE, Jamison SR, Spicer M, Bernard S (2006). "Inhaled methoxyflurane as a prehospital analgesic in children (subscription required)". Emergency Medicine Australasia. 18 (4): 404–10. doi:10.1111/j.1742-6723.2006.00874.x. PMID 16842312. ^ McLennan JV (2007). "Is methoxyflurane a suitable battlefield analgesic?" (PDF). Journal of the Royal Army Medical Corps. 153 (2): 111–3. doi:10.1136/jramc-153-02-08. PMID 17896540. Archived from the original (PDF) on 2011-07-15. ^ Medical Developments International Pty. Ltd. (2009). "PENTHROX (methoxyflurane) Inhalation: Product Information" (PDF). Springvale, Victoria, Australia: Medical Developments International Limited. Retrieved 2010-11-21. ^ National Prescribing Service (2010). "Methoxyflurane (Penthrox) for analgesia (doctor's bag listing)" (PDF). NPS RADAR. Canberra, Australia: National Prescribing Service, Department of Health and Ageing. Retrieved 2010-11-21. Patton J (February 1998). "Breathing life into protein drugs — Inhalation of therapeutic macromolecules is a feasible, natural, more people-friendly, delivery system". Nat. Biotechnol. 16 (2): 141–3. doi:10.1038/nbt0198-141. PMID 9487516. This page was last edited on 11 April 2019, at 17:53 (UTC).